Just beyond these rocks is where the Noordhoek surfers go – it was pretty wild the other night – too dangerous for surfing, and too dark. But I couldn’t help but be impressed by the power of the waves. Capturing them is always an experiment in time. A very long exposure (like my favorite 4 minutes) is great for very flat water making it glassy and mysterious, but it just blurs out big waves. With very short exposures of less say than 1/500th sec, you can get very sharp images of waves, but these rarely to my mind, convey the power and the sense of density and movement of the water. There is some happy medium which veers towards the short rather than the long end. 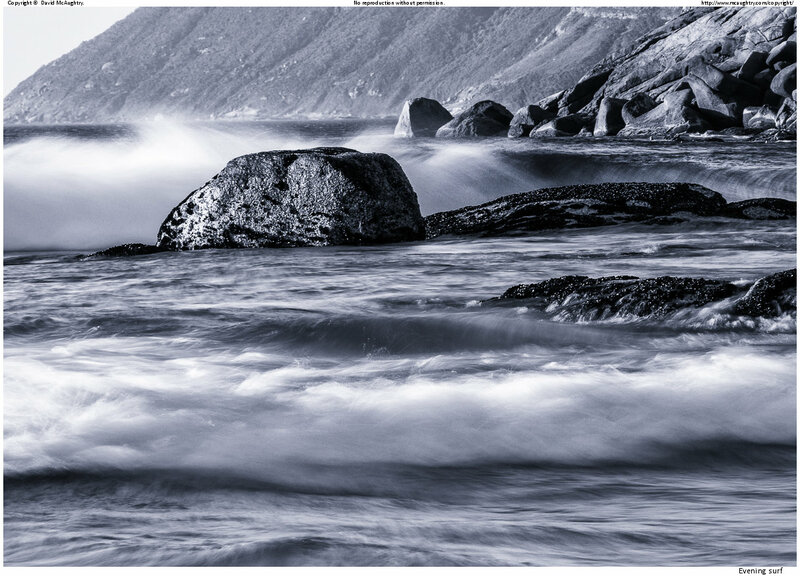 This was taken at 4/10 sec, as part of a fast frame series of a wave breaking over the big rock in the mid-ground. It’s best seen blown up (double click on the image), and then you can see the waterfall-like lines of the rear wave as it curls over on the right hand side, and the totally different quality of the water in the foreground wave. After noodling around a little I did a slightly tricksier colour version of this image. You can see it here on Flickr. Which do you like best? Why not leave a comment on Flickr……..